New Yorkers seem to be “taxed to death”, paying the highest average property taxes in the country. We are the only state that charges a tax for the making of a mortgage. 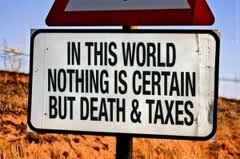 The tax burden does not end at death, as New York also has its own estate tax. Governor Andrew Cuomo, seeking re-election this year, has been encouraging the state legislature to reduce these burdens. Estates may be subject to both federal and state estate taxes. During the past thirteen years, the federal estate tax has been modified. The federal taxable exemption now stands at a generous amount of $5,340,000.00 per person. This generally means that estates that do not exceed this amount are not subject to federal estate taxes. As many people do not have estates that exceed such amount, federal estate tax is not a concern for most families. However, New York State has levied an estate tax on estates exceeding $1,000,000.00 until a revision to the law was passed in April of this year. Since many New Yorkers could easily have assets exceeding $1,000,000.00, considering high property values, many of our residents have been subject to state estate tax. The revision to New York’s estate tax law now provides that the exemption will immediately rise to $2,062,500.00, so that only estates valued above that amount will be subject to New York state estate taxes. Further, each April, the state estate tax exemption is set to rise by $1,062,500.00, until it reaches $5,250,000.00 in 2017, then the exemption will continue to rise to close to $6,000,000.00 on January 1, 2019. Tax liability will certainly be a “moving target” during the next five years. Since none of us has the luxury of deciding in which year we will pass away, changes to the tax law require review of existing estate plans and potential redrafting by qualified attorneys. Wills should be evaluated to make sure that the surviving spouse is not potentially left “cash poor”. Many of our readers may be familiar with language that is typically found in a Will, something to the effect of “I give to a trust for the benefit of my spouse that amount which shall be exempt from federal/state estate taxes, and the balance of my estate outright to my spouse”. As such exemption amount increases due to legislation, more assets will be held in the trust, with less inherited outright, leaving the spouse cash poor unless the estate is valued much higher than the estate tax exemption amount. Further, when the New York estate tax exemption stood at $1,000,000.00, sensible New Yorkers created life insurance trusts and other mechanisms to potentially reduce estate taxes. Now, it may make sense to dismantle some of these trusts, after complete evaluation of all issues. Gift taxes are also affected by the legislation, in that gifts made within three years of death are brought back into the estate and some out of state property may be brought back in to the estate for valuation purposes. Gift planning should be accomplished as soon as possible so that gift transfers are not nullified for tax purposes. An experienced attorney skilled at drafting legal documents and knowledgeable of legal updates will review your current estate documents and revise them accordingly. We look forward to assisting you during this period of legislative change.